Moments of Mommyhood: I'm Blushing! I have recently received this new award from two of my fellow bloggers, The Peterson Party and Super Fun Mama! These two blogs are so great! They do amazing things with their children to help them learn and grow and I am honored to receive this award from them! Thank you so much! I really appreciate your kindness! Thank the person who gave the award to you, post the award on you blog or on a post, nominate 10 blogs which show great attitude/gratitude, link to the people you chose on your post,and comment on their blogs to tell them about the award! I really enjoy reading all of your blogs! Thank you for the inspiration! Thanks for the award Sandy!I can't wait to post it! Thank you so much for the award! I feel so honored. Thank you so much for thinking of me!! I have to go check out the others now. Hey, thanks for the comment. Stay in touch. Congrats on the award. We did the I love you card yesterday. The kids had a blast. Hosting a giveaway on my blog. Come and check it out. Sandy, it's an honor to get this award from you! In my eyes, you are the Queen of Kid Creativity and I LOVE IT! Thanks so much for this...now I'm the one blushing. :) Can't wait to check out the other blogs you awarded. Well, now I'M blushing! Thanks girl! You totally deserve al awards and recognition you get. I love your blogs! Thank you Sandy. I have been away from Blog land a couple of days. I appreciate your kind words. I enjoy your blog too. Sandy thank you so much! 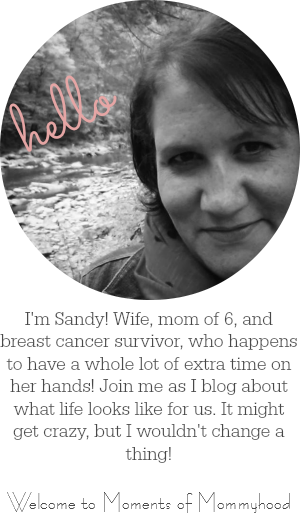 I have wanted that cute Creative Blogger award - hee hee.